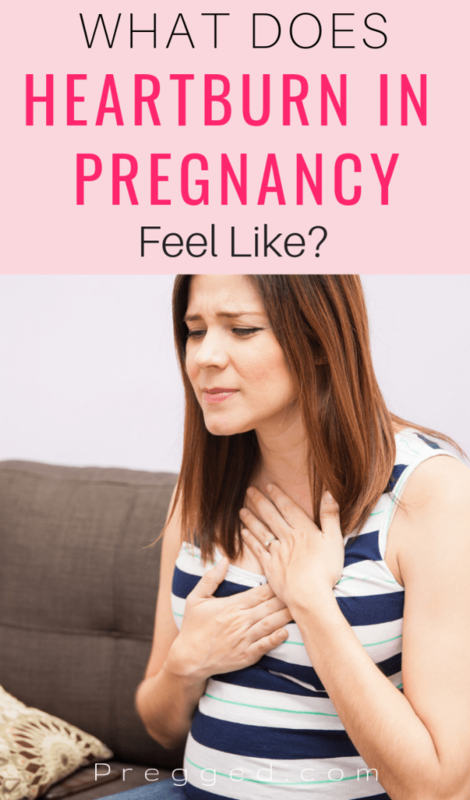 Home » Pregnancy » FAQ » What Does Heartburn Feel Like When You’re Pregnant? Pregnancy tends to throw up countless weird and wonderful symptoms for us to cope with. These symptoms aren’t just related to your stomach area. Oh no! You will get symptoms in your feet, your legs, your stomach, your head, everywhere. One pregnancy symptom which a huge number of pregnant women experience is heartburn. It is estimated that eight out of every ten pregnant women, will experience heartburn to some degree. So if you’re feeling a distinct burning after you eat, you’re in good company. But exactly how does heartburn feel during pregnancy? You don’t have to be pregnant to experience heartburn. Many men and women experience it daily. Heartburn is usually felt as a sensation of burning that is usually felt starting between your breasts and upwards to your throat. You might feel a burning or acrid feeling in the back of your throat if you happen to burp (a common, yet rather unpleasant side of heartburn) or you might just get the burning. If you do get the acid coming back up your throat, this is called acid reflux and it goes hand in hand with the condition. Heartburn may cause pain in the chest and back and this is why it is sometimes confused with the symptoms of a heart attack. Many people can get heartburn simply by eating something spicy or acidic but heartburn in pregnancy is often unrelated to what you’ve eaten. 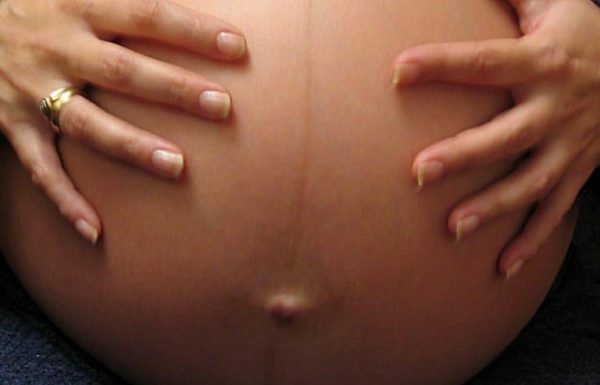 What Does Heartburn Feel Like During Pregnancy? When you’re pregnant the crazy hormones and changes which are going on within your body can make heartburn and acid reflux much more common. You’re more likely to have heartburn in late pregnancy but it can also be an early symptom. Your growing baby bump pushes everything upwards including your stomach and all the digestive juices. Pregnancy heartburn can also be due to the hormone progesterone. Progesterone makes your uterus muscles relax, but it also does the same thing to the valve which separates your stomach and gullet. The burning comes from the acid in your stomach making its way back up your esophagus. It’s a rather annoying symptom of pregnancy that can be very uncomfortable and painful. Occasional heartburn and acid reflux are generally harmless to you and your baby. However, it can be uncomfortable. It might also continue after you have the baby particularly if you are breastfeeding. Some people who regularly suffer from heartburn find that eating certain foods or eating too much late in the evening are triggers. Managing your heartburn issue in pregnancy could be as simple as tweaking your eating habits. How Can I Relieve Heartburn in Pregnancy? The bad news is that you probably won’t be able to get rid of heartburn completely. You can, however, avoid common triggers and possibly reduce the number of episodes. Common triggers for heartburn include eating certain foods, bending over too quickly or laying down too quickly after eating. Try sitting up for an hour or so after eating. Also eating your food too quickly and not eating often enough are triggers. Take your time eating and eat smaller meals more frequently. Some women also find that heartburn is usually worst during the night, so do your best to avoid eating for three hours before you go to sleep. Put some books or bricks under the head of your bed so that you sleep on a slight angle. This will help keep your digestive juices where they are supposed to be. Take care to remain hydrated by drinking plenty of water during that time. There are some medications that could actually make heartburn worse. Common culprits include antidepressants and some NSAIDs (non-steroidal anti-inflammatory drugs). It is important to talk to your health care provider before you stop taking any medication, even if you are fairly certain it is causing your heartburn. If you find that heartburn is becoming a huge problem, speak to your doctor or midwife. He or she can direct you to over-the-counter heartburn medicines that are safe to take during pregnancy. There are some heartburn medications, such as antacids, which might cause you to have an upset stomach. Others shouldn’t be taken because they may increase blood pressure and increase your risk of pre-eclampsia. Again, check with your doctor or pharmacist to be sure before taking any new medicine. Although uncomfortable, heartburn is more of an annoyance in pregnancy than a serious concern. If you are worried, it doesn’t hurt to have a chat with your doctor, pharmacist or midwife. Be assured, however, that a huge number of pregnant women develop heartburn and acid reflux towards from the midpoint of their pregnancy onward. As your baby grows, everything moves and changes. This alters the way the main systems within your body function in some ways. When it comes to your stomach, even the smallest shift can set things off kilter. If you have never experienced heartburn before the way it feels and the intensity of the pain might come as a shock, but it is certainly nothing to be overly worried about.